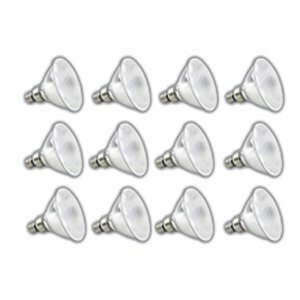 THIS IS A 12 PACK BUNDLE - 90 WATT PAR38 SPOT HALOGEN LIGHT BULB - 130 VOLT - 10 DEGREE SPOT LIGHT BEAM SPREAD - SHATTERPROOF SHATTER RESISTANT COATING - LONG LIFE 6,000 HOURS - THIS SHATTER RESISTANT BULB MEETS ALL CURRENT FEDERAL ENERGY EFFICIENCY REGULATIONS & MEETS OR EXCEEDS DEPARTMENT OF ENERGY EFFICIENCY REQUIREMENTS - Supra Life 6,000 hour shatterproof bulbs last up to 10 times longer than standard bulbs! The unique tough coat rubberized coating prevents shattering of the outer bulb glass in case of accidental breakage. Bulborama tough coat shatter resistant bulbs satisfy local city and state food service and fire department regulations. Supra Life halogen lamps use a rigid quartz capsule for durability that ensures precise beam control through solid state design, while providing 13% energy savings compared to standard halogens. A unique coating on the reflector allows the heat to escape from the back of the lamp while directing light out the front. Rated at 6000 hours, Supra Life halogens will last and average of 12 months in commercial and retail applications, while providing up to 5 years of life in normal household applications.